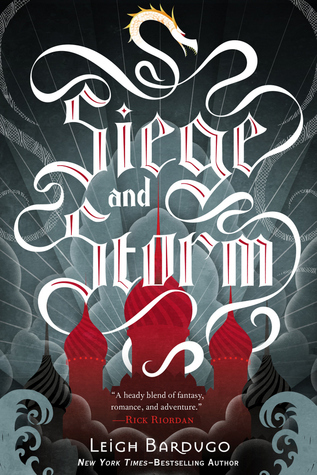 Warning: Siege and Storm is the second book in Leigh Bardugo's Grisha Trilogy. If you have not read the first book, Shadow and Bone, then there will definitely be spoilers in this review. 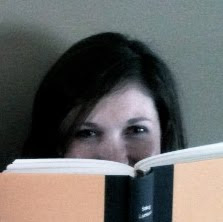 Check out my review of the first book here: Shadow and Bone. 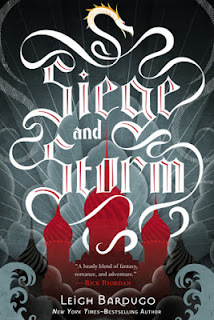 Siege and Storm begins right where Shadow and Bone left off. Alina and Mal have taken refuge on a ship sailing north hoping to travel far away from the Darkling. While on the run, Alina is haunted by her life as the Sun Summoner and feels a strong need to use her powers. It is not long before the Darkling is able to find Alina and Mal and take them captive aboard a whaler. They soon learn that the Darkling has plans to make Alina the most powerful Grisha in the world. My Thoughts: This second installment in the Grisha Trilogy is just as good, if not better than the first. Bardugo once again provides interesting twists and turns throughout the novel that are not expected. 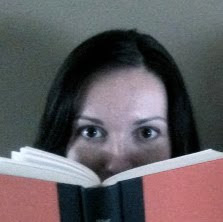 I love that she keeps her readers on the edge of their seats, wondering what will happen next. New characters are also introduced including: Sturmhound, the captain of the whaling ship, and two members of his crew. These characters become key players in the novel and take the story in a completely different direction than I could have imagined. I must also warn that while I thoroughly enjoy all of the twists and turns, they were somewhat frustrating. Alina really struggles in this novel and I found myself verbally trying to help her make decisions about what to do next. Needless to say, I am very much looking forward to the third and final book to see how this wonderful story ends. Note: I received an advance copy of Siege and Storm to write this review. Its actual publication date is June 4, 2013.